Wednesday is National Signing Day. With numerous defections and the ability to close on a few kids late, Spaz's class remains in flux. The only certainty is that this will be BC's smallest class in years. Scouting service projections predict BC will sign 15 kids. The last time BC received just 15 commitments was 2005. Later this week I will get into some of the macro issues of a small class, but for now let's look at what 15 players can mean to BC. This class was not ranked in the Top 50 nationally. Among ACC teams, it was considered the 10th best. The class contained two 4-star commitments, nine 3-star commitments and four 2-stars. Of course the highest ranked players -- Andre Jones and Pat Sheil -- had the least impact. While 2-stars Marcellus Bowman, Nick Rossi and Jim Ramella all became important contributors. Players who never played for BC: Andre Smith. Smith committed to BC over multiple seasons but never cleared admissions hurdles. He eventually played at Akron to mixed results. Players who did not use all the eligibility: Allan Smith, Brady Smith, Razzie Smith, and Pat Sheil. Allan dealt with injuries. Brady Smith ran into trouble and was kicked out of school. Razzie was a servicable backup but was not given a 5th year. Instead he finished up at South Carolina State. Sheil had injuries and never lived up to the hype. He did not use his fifth year. Played as true freshman: Paul Anderson and Jim Ramella. Anderson was overshadowed by some of his DB contemporaries, but was still solid. Ramella played as a true freshman and then dealt with a series of injuries. He did play after a medical redshirt but never became an elite player. NFL Draft Picks: Matt Tennant. Bottom Line: This small group of guys were part of one of the most successful runs in BC history. They also reinforced the idea that BC might be better at evaluating under the radar guys as opposed to four star talent. The biggest concern as it pertains to this year's small class is the attrition rate. 1/3 of the signees did not use all their eligibility (for various reasons). Also, only two guys played as true freshmen. If those two trends recur, Spaz and/or another BC coach is going to have holes to fill with future recruits. With one losing lesson on his resume and porous recruiting class set to sign, many are wondering what sort of hole Spaz will leave for his successor. I've made the argument on message boards, twitter and in numerous conversations, that it doesn't matter what Spaz does. If BC hires the right coach, we will rebound. You only need to look at the rebuilding jobs Greg Schiano performed at Rutgers and Al Golden performed at Temple to know it can happen. Both were black holes where coaching careers went to die. But both guys saw potential and believed in themselves and turned around moribund programs. Before I get into my blueprint for Golden and Schiano, let me state that I don't know how they will do at their current jobs. Rebuilding is different in the NFL or taking an underachieving program like Miami back to elite status. I don't know if either are the greatest Xs and Os guys. But those issues aren't relevant to BC's potential issues after Spaz. 1. Recruiting, recruiting, recruiting. Schiano and Golden both have a bit of used car salesman in them. Those sort of personas have always been a turnoff for me and other BC fans. But the reality of college football is you need the face of your program to connect to recruits, their families and their coaches. While Schiano and Golden had plenty of misses among their recruiting rosters every year and never delivered elite classes, they recruited harder and better than anyone ever did at Temple and Rutgers. As head coaches they were on the front lines and in the recruits's faces. That sets a tone. BC's next coach has to be the same way. Every coach we've hired since Henning showed a strong push on recruiting when first hired and then drifted from that focus. BC's next coach has to love to recruit and love to sell. 2. Facilities. You don't need the best facilities to win. You just need slow, continuous improvements to your facilities. You need to be able to sell recruits that "we've just done this and the really big project is coming." Spaz won't make a big deal out of it, but guys like Golden and Schiano would make our renovated weight room or the new turf seem like they were the biggest projects in Boston since the Big Dig. The momentum of those improvements shows progress and combats the coaches who say "BC's facilities are ancient." Eventually BC will have to build a permanent practice facility, but for now they just need to have an incremental upgrade each season. 3. Control. 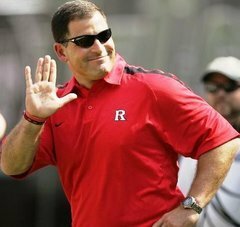 Rutgers gave Schiano total control when he was hired. They just lost a chance to hire Mario Cristobal because they wouldn't give him the same control. They feel they don't have to now. As BC fans know all to well, hiring a coach based on who he would keep on his staff is a short-sighted move bound for failure. Our next coach needs total control. That doesn't mean he can recruit anyone or doesn't have to graduate players. At BC, those things are a given. But it does mean he can hire his whole staff, set the schedule and play any style he prefers. BC's current coaches don't have those powers now. These keys are the blueprint for a comeback but I think it is a bit of fantasy on my part. As long as Gene is making the call, no coach will be given the same latitude that Schiano and Golden were given when they changed two terrible programs. This was a terrible loss. The team outplayed Miami for most of the game yet their mistakes kept the Hurricanes in it. Then at the first sign of Miami going on a run, the team melted with numerous mistakes and a lack of effort. I don't expect the guys to play great every game. But I do expect them to have more poise than this. They got run out of their own building against a mediocre team in a game they controlled. How did that happen? Before I get into likes and dislikes, let me address the Patrick Heckmann situation. He's been diagnosed with Mononucleosis. This explains a bit of his lackluster play of late. The illness will sideline him for most of the season. Speculation is that he will be back in late February or early March. While unfortunate for him, I don't think the team will face much of a setback. Heckmann's been a non factor lately. While the team has had problems, I don't think he would have been the difference maker. Now he gets a chance to sit, decide if he wants to stay in the U.S. and the other players get to develop. -- Matt Humphrey's effort. Smart shot selection for the most part and really strong defense. He can set a tone with his D.
-- The trapping and rotation on defense. The guys looked good for long stretches doubling their big and rotating around. -- Daniels driving to the basket. He can convert those. If he does it will open shots for other guys. Ryan Anderson making his foul shots. His role will be as a post player. If he converts his free throws, he'll be that much more effective. -- Turnovers. Even before Miami's run the passing was very sloppy. Everyone was guilty and it was often making passes that didn't need to be made. -- Not having an answer for their run. Donahue called a timeout, but their was no stopping Miami. He need a calming influence and some plays that can get the tempo back on our side. BC needed overtime to complete their weekend sweep of UNH. I am fighting every urge in my body to slam Spaz for losing another recruit. This time it's Donavan Henry, who decided he'd rather run track at Northeastern. I pray that Spaz salvages the class this weekend. Rutgers commit Michael Giacone visited BC this weekend. This article on Coughlin and Belichick is sprinkled with anecdotes from TC's days at BC. This report says that Donnie Fletcher's stock is down after his Senior Bowl week. He also allowed some long receptions during the game. Maine is locked in for BC's game on September 8. Duke's legendary basketball fans -- the Cameron Crazies -- made news this week as fewer and fewer of them are attending basketball games. This trend should raise eyebrows at every private school playing big time sports. At BC it should set off alarms. Duke has a high-profile and historically dominant basketball program with a limited-availability student section. Every current student at Duke was well aware of this experience prior to arriving on campus. If they can't get their kids to come to games, what hope does BC have? This is more than just winning and losing. This is about kids today, current trends and the changing sports culture at private schools. Gregg Doyel thinks kids are bored. I agree that the sameness of the game day environment is a factor. I know when I was a student a decade ago there was always something going on around campus. Going to a BC sporting event was just one option. Now many of those same options and distractions exist plus a million more entertainment choices. Going to the game -- regardless of the outcome -- might not seem that exciting when you can watch in your room while also playing video games or hanging out or studying or whatever. There's another theory often mentioned on the BC message boards that is probably applicable to Duke: Nerdification. As both schools continue to raise their academic profile (Duke remains above BC) and continue to become even more exclusive in their admissions, the student body is bound to become more serious and academically focused. While plenty mock nerdification, I am not suggesting BC or any school hold back on bringing in the best and brightest. They just need to understand that those students might not care as much about sports. Current students at Duke and BC are accomplishing incredible things and working very hard. It is no wonder they don't have time to go to games. State schools can offset their nerdification with pure numbers. It is easier to fill a student section when you have 30,000 undergrads. I don't know Duke well enough to suggestion solutions for them. But BC should realize that winning games is not the only way out of our student malaise. I think the answer is shrinking the student sections and creating some demand for the seats. While I love the Superfan tradition, I think BC needs to do more to educate the new students as they arrive on campus. Being a BC fan is about more than just a yellow t-shirt. Indoctrination about our history and the experience are the way to go. If that doesn't work just tell them they can use game attendance to earn extra credit. This may be the era of constant video and wonke football talk, but there isn't much out there on Doug Martin. I did come across this video which will give you some insight into what he wants to install. Martin is talking about New Mexico State but the applications to BC are numerous. He was only at NM State one year and was just installing his offense when he gave this interview. What stood out to me was that he described the scheme as West Coast and has an emphasis on short passes to set up the long passes and runs. The meet begins 9 AM at the Flynn Recreational Complex. It will continue until 4 PM. BC will host and compete against MIT, Smith, Brandeis, Vassar and Brown. This is BC's first conference meet of the season and the last home, duel meet for seniors Peter Souders, Brian Like, Chelsea Rosenbauer, Gabi Goode, Molly Wolfe and Michelle Gaglia. Tampa Bay hired Greg Schiano and it had a ripple effect on BC recruiting. BC is targeting Don Bosco WR Leonte Carroo. They are also trying to get TE Michael Giacone. This shift is a gift for a BC class that had numerous holes to fill. Let's hope our staff is working overtime to close these kids. Jags and McGovern were both mentioned as candidates for the Rutgers job. I don't think either will get much beyond an interview. Rutgers will reach for someone with some sizzle. I am not sure how Jags would fit in Piscataway, but I actually think McGovern would do very well at Rutgers. He's not the showman that Schiano was but he knows New Jersey. Leveraging those roots could build on Schiano's recruiting momentum. The question that will haunt McGovern in any interview is how much the defense is his doing and how much is Spaz. “I spent a lot of time with Coach Murphy and not much time with Spaz [BC head coach Frank Spaziani],” McShea said. “That's basically what it came down to. BC slow played McShea so you can sort of rationalize Spaz not putting time in with the kid, but that just raises other questions. Why don't we cultivate our backups better? Why don't we kick up the sales pitch when it appears that other recruits are waivering? The other story was BC missing out on QB Matt Johns. How did we lose him? Mike London's charm and sales pitch. “When I went to Boston College I was like, ‘this is it,’” Johns said. “My parents said, ‘let’s go visit Virginia.’ We actually went down and spent a day with the coaches and got to talk with them and then I had a little sit down with Coach [Mike] London. Army announced earlier this week that they had switched dates with BC. We will travel to West Point this fall and they will return in 2013. There's been speculation as to why they switched. I think it comes down to BC trying to change perception and tweek demand. A seven game home slate going into 2012 with Spaz and a lagging economy is not enticing to BC. If they keep it smaller and highly desirable (ND, Miami, Clemson, VT) there won't be as much Grouponing. The hope would be that the program and the economy would be in better shape to help ticket sales when Army returns in 2013. BC lost to UVA by 17 and I am encouraged. It's been one of those things. Not all loses are created equally with this team. For example, the Wake Forest game was very discouraging. The team had no poise, terrible movement and questionable effort. Tonight against the 'Hoos, the team kept fighting and showed much better offensive decision making. Here are my likes and dislikes. Leave yours in the comments section. -- Dennis Clifford's ability to get off a shot inside. He still makes mistakes and puts the ball on the floor too much, but I was very impressed with Clifford's ability to post up inside against a good defensive team and still get off his shot. It leads me to believe he'll start killing teams that don't have defensive big men. -- Lonnie Jackson's basketball IQ. When he drew the foul on the 3 attempt it reminded me of Jared Dudley. He also made good decisions on penetrating and on help defense. -- Ryan Anderson's Defense. Nine defensive rebounds and a block. He played really well. -- Patrick Heckmann's entire night. He only played 11 minutes but they were pretty bad. I tweeted about it and a few other's chimed in. I have no idea what's wrong, but he made some terribly sloppy, careless passes that cost BC on the other end. His defense was terrible too. Maybe he is still hurt. Maybe he's home sick. I don't know but until he gets out of it we cannot afford to waste possessions like that. -- Rushing shots as UVA pulled away. BC tied the game at 44 and then UVA went on a run. That's expected, but I didn't like the way BC just rushed shots and chucked 3s. A smart basket would have slowed UVA and potentially gotten BC back in the game. If more people cared, I think there would be outrage about the Women's basketball team. Wednesday night North Carolina ran them out of the building, winning 77-46. BC is now the only ACC team yet to get a conference win and only has five wins overall. The concern is that this is Crawley's fourth season and the decline has been steady. BC fans can be patient but I think BC needs to show a little more fight as the season winds down. Donnie Fletcher is making the most of his time at the Senior Bowl practices. This report noted that he had speed in one on one drills. He also showed strength and pushed a WR around. One of BC's Plan B recruits -- Jameson McShea -- decided not to commit and is going to Harvard. Gene told Around the Res that this class would have 18-19 recruits. If Spaz is on the same page, he better scrounge up some new verbals quickly. Cory Schneider weighed in on the Tim Thomas White House controversy. Coachingsearch.com is reporting that BC is set to hire former Penn State Strength & Condition coach John Thomas. 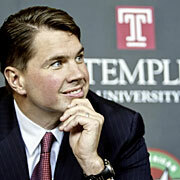 Like most staffers under Paterno, Thomas was not retained by new coach Bill O'Brien. Thomas is of the High Intensity Training school of thought. This is about having guys lean and able to do multiple repetitions. It is probably closer to what Jason Loscalzo taught as opposed to the more stretching and mobility school of thought used under Todd Rice and TOB. Here is a good recap from a guy who trained under Thomas. For those who care, Thomas doesn't like overweight linemen. I don't know Thomas's connection to Gene or Spaz. My guess is Spaz both are connected enough to Penn State people, so that when these guys were cut lose they could pick them up. Obviously with any Penn State hire, someone will ask "what did this guy know about Sandusky." I don't think it is an issue at all. Thomas is not a recruiter and did not overlap much with Sandusky. Although Sandusky had access to the facilities there have never been any reports that a S&C coach witnessed anything. Overall, I think this will be a solid hire. BC needs someone who can coach these guys up and get them in shape. As an outside observer, Penn State always seemed to have that area covered. SI.com featured Jared Dudley. He continues to do the little things the Suns ask. I also find it interesting that despite his growing media profile, Dudley still sees his future as a college basketball coach. After spurning BC, Akeel Lynch officially committed to Penn State. BC used the open scholarship to offer Massachusetts Tight End prospect Jameson Mcshea. BC also locked in a verbal commitment from Ohio DB Bryce Jones. I hoped the two ACC wins were a sign that BC could beat the lessor teams in the conference. They struggled to do that today in loss to Wake Forest. There were plenty of issues but the offense was stagnant. We couldn't get much going inside because of Wake's shot blocking and then weren't hitting out 3s. Even though we had some successful give and gos and pick and rolls, I think we still need more cutting to the basket. Maine beat the men's hockey team again and this time it wasn't close. The game was tied in the 3rd, but Maine went up and then picked up some empty-net scores late. The BC women fell to 0-6 in ACC play with their loss to Virginia. Dirk Koetter -- Matt Ryan's new Offensive Coordinator -- has made the rounds in coaching. What I didn't know was that Coughlin hired him at BC before he left for Jacksonville. I always assumed he was brought in by Dan Henning. This article on Coughlin quotes a few BC folks. This Rivals article paints a gloomy picture for our upcoming recruiting class. As I just tweeted, Jason Loscalzo is leaving BC for Washington State. This may not seem like a big deal, but the roll of the Strength and Conditioning coach is becoming more and more important as he is the only staff member allowed to interact with the players year round. I will have more later. Around the Res posted the second part of their interview with Gene. They did a nice job. These types of interviews can be difficult and lend themselves to pat answers, but Around the Res didn't go with just softballs. They pushed on recruiting and on our football success. This article on Kuechly includes a note about transfer Marcus Grant and early enrollee Joel Zoungrana already being on campus. With Donnie Fletcher's invite, BC continued its streak of sending players to the Senior Bowl. BCI crunched some of the numbers. Two ACC wins provided a big boost of confidence to this young BC basketball team. They also have us believers thinking this fledgling squad will mature quickly and compete soon. Thursday night will provide another test as the guys take on NC State. The Pack are 13-5 and very good offensively. To win BC is going to need to be strong defensively and cut down on turnovers. Even though it is early, this could be a big turning point in the season. A win would prove that the team can compete against the better ACC teams on the road. It would also provide a much needed boost to BC's RPI rankings. I am suspicious of BC recruit Win Homer's bump from three star to four star on Rivals.com. Earlier this week, Rivals updated its Rivals 250 and the Virginia OL prospect debuted at 248. Previously Rivals gave Homer three stars, listed him as the 51st best tackle and the 12th best player out of Virginia. Even though he now has four stars plenty of players above him in his position ranking and in his state ranking still only carry three stars. The three other major services, Scout, 247Sports and ESPN have not altered their rankings of Homer. Why was Homer bumped and why now? He hasn't played since the last ranking. He hasn't received any new offers that we know of. My suspicion is that a BC-friendly evaluator gave a BC-bound prospect a bump to help BC's overall ranking and offset some of the bad news on the recruiting front. In a potential quid pro quo, BC gets an artificial improvement to its class and the largest BC recruiting news site continues to keep a good relationship with Spaz and staff. Let me state that I am not accusing all of Eagle Action (Rivals's BC site) of juicing the stats. In fact, I think Eric Hoffses is the best BC beat writer around. I also think Adam Rose is a rising star on the BC media scene. My long problem with Eagle Action has been with Mike Farrell and his willingness to color outside the lines when it comes to BC recruiting. As I have always said, rankings really shouldn't matter. It is a subjective, man-made measurement. There may be a correlation with rankings and success, but I don't believe there is causation. BC's talent should be judged by how it does on the field. Who and how we bring in talent is important. What outsiders think of that talent is meaningless. Homer may be the best member of this BC class. I hope Rivals collectively found something in his tapes or recruiting to make them think he will be a star. If they were throwing a bone to Spaz, then all they did was tease BC fans...again. BC finally responded to Lively's criticism with the following statement. Steve Lively’s letter regarding Athletic Director Gene DeFilippo is perplexing and unfortunate, and filled with irresponsible and baseless claims. It has caused a number of people, including several of Steve’s former football teammates, to express concern for him and his judgment. Under Gene’s leadership, the BC Athletics program has remained true to its traditions and the pursuit of excellence. Boston College has one of the highest student-athlete graduation rates in the country, its athletics facilities have been upgraded significantly, and its athletes have succeeded on the field and in service to the wider community. Gene DeFilippo has the confidence, respect and support of countless members of the Boston College community, including University President Fr. William Leahy, as well as colleagues in intercollegiate athletics throughout the United States. I blame Gene for many of the issues currently facing BC sports. I also think he oversteps his role and can lack tact at times. That doesn't gloss over all his many accomplishments while at BC or the improvements he has made to the school. We joke about how he is quick to remind people what things were like when he arrived, but he does deserve credit. However, he is in a high profile role required to make tough decisions. Over 15 years you are going to upset people, make enemies and make plenty of poor decisions. Also after 15 years you will tend to get complacent, set in your ways and start to think your past success means you can always make the right decision. Gene's persona and the comments he continues to make to the media and alumni are going to cause controversy. As much as we would like a victory lap conclusion to his career and smooth transition to his retirement, he may be too controversial for that to happen. Lively can keep challenging Gene, but the statement from Dunn shows that the school's leadership has Gene's back. At this point I recommend individual fans keep up with your personal feelings and continue to use your gifts to the school as a vehicle to send a message. Following on the decommitment of Sam Grant, running back Akeel Lynch announced that he will not be attending BC. With Jaxon Hood taking other visits and Steven Daniels rumored to be having NCAA admissions issues, Spaz finds himself with multiple holes in his already small recruiting class. I have never been one to get worked up about recruiting rankings. I do get concerned about roster management. I also think this raises questions about Spaz and his staff's approaching to recruiting. Spaz has two weeks to fill these holes and prove that he can still sell BC to waivering recruits. This is Spaz's fourth recruiting class. His defenders have been pointing towards it for two years. They said that a smaller class would allow Spaz to focus on quality. They also said he would use the extra time to really hone in on players who fit at BC. Now it looks like that time was wasted. While I am sure the losing season hurt his message, a good salesman would use the losses as a chance for players to make an immediate impact. Finally the question needs to be asked: if Spaz isn't winning on the field and isn't closing on recruits, how can Gene keep saying he doing a great job? It doesn't look like many members of this recruiting class will help Spaz this season, but if he doesn't recruit well it makes the rebuilding job post-Spaz that much harder. Always known for selective enforcement, the NCAA has some explaining to do regarding their denial of Ifeanyi Momah's 6th year of eligibility. Compare his case to two more prominent players who received an extra year of playing time. Case Keenum redshirted his freshmen year (fall 2006). He played in 13 games as a redshirt freshman (fall 2007). He played in 13 the following year (fall 2008). His redshirt junior year saw him start in 14 games (fall 2009). In his fifth year (fall 2010) he started three games and suffered an ACL injury. The NCAA granted him a sixth year and played in 14 games. In all he was allowed to play in 57 games and his school was not punished for their elective redshirt in 2006. Robert Marve redshirted his freshman year (fall 2007). In his redshirt freshman year Marve started 11 games. In 2009 he transferred to Purdue and had to sit out a season. This used his third year of NCAA eligibility. In his fourth year of eligibility (fall 2010) he started four games before injuring his knee. After recovering from his knee injury, Marve played in 10 games (2011 season). It should be noted that Marve also admitted to the NCAA that he received illegal benefits as part of the Shapiro scandal at Miami. But was sparred punishment because of his cooperation. He was just granted a 6th year of eligibility. In all Marve has played 25 games, played in multiple games across three seasons and allowed to transfer and escape penalty even though his former Miami teammates had to miss games. Now a reminder on Ifeanyi Momah's history. He played in seven games as true freshman in 2007. He only played in 11 games as true sophomore due to injury. He redshirted in 2009. In 2010 he played in 13 games. In 2011, he was injured in the first game. That consists of only three full seasons. He has never been in any trouble and has his degree. He missed one full season due to injury and 83% of another season due to injury. Why was he not given the same opportunities as Marve and Keenum? BC is following the proper channels, but this stinks to high heaven. If the NCAA doesn't reverse its decision on appeal, the school should hit the media hard. Because they have yet to invite Juniors, Kuechly is still not on the list for linebackers at the NFL Combine. NFLDraftScout.com lists him as the top inside linebacker prospect. This analyst thinks Kuechly would be a good fit with the Philadelphia Eagles. Paul Peterson will call plays for Sacremento State this year. Let's hope he lights up the scoreboard and we can bring him to BC one day. As he stated, Mike Dawson has left college coaching and is now the AD at a Massachusetts high school. Scout posted an update on Sam Grant...and it is not looking good for BC. Two weeks ago I feared BC would have a terrible ACC slate. Now after three games we are 2-1 in conference. Saturday's solid win over Virginia Tech was another example of the team maturing. This was the most they've gone inside and it helped the offense all over the floor. The defense was much better too. Now I am feeling better about how the team will do in the following weeks. BC made the most of their second Frozen Fenway appearance by beating Northeastern 2-1. The win wrapped up a sweep of the Huskies. BC commit Sam Grant visited Michigan this weekend and is now choosing between Michigan, Oklahoma, and Arkansas. It has been floating around the BC message boards for a few days, but BC confirmed that this will be Spaz's staff for 2012. Ben Johnson -- who served as the interim Tight Ends coach this fall -- will be moving on. Per NCAA rules, he cannot move back to his Graduate Assistant spot. On paper, I think this is the best staff of Spaz's four seasons. We will see if the results on the field change. The best moving of the pieces might be what Gene and Spaz did with Brock and Devine. Both are valuable recruiters, yet had questionable results as OC and OL coaches. Now we keep them on staff, yet have a tactical and teaching upgrade at those key positions. What's interesting is that despite all the rumored grumbling, that most of the guys stayed. BC certainly has its drawbacks, but the grass is not always greener. What was Max Holloway thinking? Max Holloway took many BC fans by surprise when he announced he would bypass his final year of eligibility to enter the NFL Draft. Max earned his degree so you cannot begrudge him for wasting an education. This clearly is a personal and football decision. But as a football decision, I don't know if it makes sense. Currently Max is out of position in BC's defense. He's a little undersized to be a classic 4-3 DE. NFL teams might see him as someone who might thrive in a 3-4. Another year at BC wouldn't have helped him hone 3-4 skills, so if he impresses in the workouts and interviews he might get drafted in the later rounds. I am sure Montel Harris's injury was in the back of his mind too. Leaving now -- while he is still healthy -- allows him the chance to play professionally. If he returns and gets hurt, that might not be an option. Finally, maybe he needs the motivation. As we've said, college football is a grind. Especially when you are not winning. If he wasn't passionate about returning to BC, it is best to move on and challenge himself. At this point, he is a long shot to get drafted. With fewer rounds of the NFL Draft the Undrafted Free Agent path is more common, but certainly not easier. A breakout season next year might have raised his stock a bit. He might also have played his last down of football. There are no guarantees in the sport. If he loves to play, giving up a final year at BC might be a mistake. For BC, this is not good news. Holloway was not an elite player, but he was very consistent and someone we could have used next year. It also makes you question the morale and motivation if players are leaving on the slight chance of getting drafted. -- Lonnie Jackson hitting 3s. If the other team gives him a little space and a little time, he is dangerous from out there. -- Defensive rebounding. One of the reasons Clemson could score for stretches were due to our defensive rebounding. -- Dennis Clifford close to the basket. He looked good down on the block. You can see how he might blossum as he gets used to the speed of the ACC. -- Not converting on Free Throws. With a team full of shooters, we need to get to at least .500 from the line. -- Humphrey's turnovers. Humphrey had another good game but was too sloppy at times with the ball. -- Heckmann's minutes. I know our other wing players got hot, but Heckmann needs to play more than 12 minutes. I got a lot of good submissions. Thanks to all who shared. Here are some of the best. 1998 Frozen Four -- National Championship game -- I was 8 years out of BC and BC last made the Frozen Four in my senior year (1990). I had tickets to the 1998 title game at the Fleet Center and I was pumped. I ate something real bad at Wonder Bar (the old Bunratty's) for lunch. I was a victim of a nasty case of foood poisoning and was relegated to my hotel room in Cambridge where I watched every second of the glorious OT game against the hated Michigan Wolverines. BC hit the post several times in the OT -- I did not know what was going to kill me 1st -- the food poisoning or the stress of that incredible contest. BC lost, I was sick all night, but I knew that BC hockey was back and back in a big way -- one could see that Jerry York was a magician and multiple titles would be in BC's future. It was just a matter of time. That 1998 BC team got me through one night of gastrointestinal hell. A couple different people sent in a note regarding Gionta's five goals including Richard and Carter. Championship party gets a little big from Stephen. Started at BC in 1997, so we had two horrific losses in the championship game our freshman and junior years. Finally had a standing room only Mod viewing party for North Dakota (round 2) in 2001 and saw the OT game winner. Our neighbors had dragged their sofa and TV into the middle of our Mod yard, so we ran outside to start drunkingly hi-fiving people. Well... other mods saw us outside and ran over... followed by underclassmen from Walsh, Vanderslice, etc. Next thing we know, the entire campus is in our backyard and it's a full scale riot. Our fence was torn down and somehow the Boston Globe got into my roomates bedroom and took a picture of the crowd from above. But the funniest part was my parents came to Boston the following day, and I had to explain to them why my backyard was no longer grass, but a sea of crushed Natty cans. But the winner were two of my loyal readers (Bill and Jane) who witnessed Snook's Kelley's 500th win in 1972. I am as guilty as other people of glossing over what happened at BC prior to my own arrival, so I am glad these two reminded us how great BC's been at hockey. As I said they both submitted the Kelley win but I only had one pair of tickets. Fortunately Jane's a big fan and already had tickets. Thanks to all that submitted and let's hope the game is fun. Usually the defense carries the day for BC. This year it was the better side of the team, but still not that good. Or at least not as great as BC usually is. Talent was a big issue, as was experience. Even with some holes in the roster a few player stood out. Kuechly concluded his BC career with one of the most statistically impressive seasons in Boston College history. His productivity and fundamentals were well known prior to the season. This year he showed an added toughness by finishing the season despite a bad elbow injury. He also got better as the season progressed. Never a real liability in pass coverage, Kuechly became much better as he proved in his performance against Miami. I've debated where he ranks among the all-time BC greats, but there is no denying he was this team's most valuable player. Because of who he played next to and because he dealt with nagging injuries in the latter part of the season, it is easy to overlook how good KPL was in 2011. We already knew he was tough and strong but this year I think he improved in his ability to diagnose plays. He blew pass blockers and did a better job when in zones. If he's healthy, he should be all conference next year. Max Holloway's biggest issue among his critics is who he is not. He's not a game-changing sack machine. But he had a really solid 2011. Fourth in tackles, the leader in sacks and he had a INT. What he lacks in dynamism, he made up for in consistency. Holloway improved from last year and improved during the season. When you look for silver linings, that is one. I was curious about the timing of the change in Alumni's new turf, so I reached out to BC. The plan is to switch out after Spring Ball and graduation. It will be ready well before practice begins in August. Tim Tebow's dad's church hasn't always said the nicest things about the Catholic Church, but I thought this Jesuit's thoughts on Tebow's praying was interesting and fair. Here is one of the first take's on Kuechly as a draft pick. Eric Hoffses talked to other writers who have covered Doug Martin in the past. The best recurring theme is that he adapts to his talent. CBS thinks we still have work to do with our football recruiting. Top verbal commitment Akeel Lynch continues to talk to other schools. Cameron Shorey -- a New Hampshire DE -- is hoping for a BC offer. Reggie Jackson is impressing folks in Oklahoma City. The marketing folks behind the Frozen Fenway event are offering one of the blog's readers a pair of tickets to BC's game Saturday. They recommended some sort of contest, so let's keep it simple. If you are interested in the tickets email me your favorite BC hockey memory. I will post the best responses and pick a winner late Wednesday. As a reminder, Fenway Park is hosting a number of hockey games for Sun Life Frozen Fenway 2012. The 16-day event began Jan. 1 and will continue through Monday, Jan. 16. Thursday: NU has their practice from 9-10 am followed by practice for Harvard/Babson and Union/Norwich. Saturday: Boston Rivalries game. At 4 p.m., the Boston College Eagles will face off against cross-town foe Northeastern Huskies. That game will be preceded by a match-up of long-time high school rivals Boston College High School and Catholic Memorial at 1 p.m.
Sunday: Back-up weather day for Saturday’s game. I love college football but I really hate the current BCS and bowl system. There are a million reasons to dislike it but my major gripe is that there are now only 12 teams eligible for the national championship and they all happen to be in the SEC. Heck, Alabama showed tonight that you don't even have to win the SEC to win a national championship. This isn't me hating the SEC due to an ACC inferiority complex. It is me hating on a system that is not decided on the field and where one conference is now benefiting from money, marketing and media hype. It would be like the World Series was only decided between the Red Sox and Yankees every year. I want a playoff. I want home playoff games and I want automatic qualifiers from all the major conferences. If we keep this slow march towards a "plus 1" and keeping the bowls and allowing six or seven SEC teams in BCS games, then most of the ACC will be squeezed out. College football will only be a power group of 40 or so schools. We need a playoff and the ACC needs to lead the charge. The conference needs to do it for the money and do it for the survival of the other 120 schools playing FBS (DIA) football. The ACC could lead the change but we have gutless apologizing leadership. The conference, its coaches and its media members are constantly defending ACC football. Who cares? We don't oversign like the SEC teams. We have more admission restrictions. Of course our football will suffer a bit. Because we are not a collection of tradition football powers and because we have a group of private schools, we will never travel as well to bowl games. I know all the ACC teams got rolled in bowl games, but once again it doesn't matter. The bowl games are quirky neutral site games after long layoffs. If we had a real playoff, I am sure a hot ACC team would make a run on occasion. Instead our leaders sit by and allow ESPN to prop up the bowl system and the SEC to be the primary beneficiary simply because they deliver ratings and hype. The regular season doesn't matter. Alabama just proved that. History doesn't matter or else they wouldn't have ruined the bowls. Academics don't matter or else SEC's would try to graduate their players. Cheating doesn't even matter. Look at the slap on the wrist Ohio State got. So we ignore all these issues to keep the old boy network of bowl reps, coaches and ADs protected. Having 70 teams in bowls helps perception. Having say 16 playoff teams would ratchet up the pressure on coaches and ADs. The ACC could lead for change. We could work with the other schools to get a playoff. We could lead by example and it would mean more money and a better chance at championships. Instead our gutless leaders will sit back and watch Alabama and LSU play for another title next year. I know that most BC fans were watching former Eagles battle it out in the Meadowlands, but BC Hockey had a game against Merrimack this afternoon. After getting an early lead, BC allowed Merrimack to come back and tie the game. Despite the competition, the crowd was strong. BC listed attendance as 7,114. BC is now 22-0-3 against Merrimack in their last 25 games at the Heights. For those who haven't already read them, please enjoy these two positive articles on BC sports. Falcons and Giants share BC ties. BC basketball honors leukemia survivor. That was as good of a 23-point loss as you'll see from BC basketball these days. I was most encouraged that the guys didn't fold. We've seen plenty of BC basketball teams give up during blowouts. These guys didn't. I was also encouraged that they went on some runs against an elite team. It was more validation that certain members of the team have ACC-level talent. The issue remains that they cannot put it all together for 40 minutes. Here are my thoughts. Leave yours below. -- Ryan Anderson scoring inside. Even though he was giving up size, Anderson did well inside. He showed good strength and good touch. It was his 3-point shooting that suffered. -- Dennis Clifford's defense. For the first time against a good team we got physical. Clifford made an effort on the boards and helped shutdown some UNC possessions. -- Productive minutes from Moton. As Daniels emerged the past few weeks, I wondered if we would see more of Moton. Today he played well. He was good defensively and in transition. -- Not enough movement towards the basket. We spend way too much time passing around the perimeter. When we cut, we had success. Donahue needs to get these guys thinking about cuts...especially with an aggressive opponent like UNC. The shotclock violations were maddening. -- The turnovers. Some of it was pressure but a lot of it was sloppy play. BC's offense has been barely functional under Spaz. There were numerous reasons and issues, but I always felt it started with the offensive line. Without solid protection up front all of other other issues were magnified. For a school that prided itself on its offensive line tradition, this was unacceptable. Finally Spaz made a change. He hired former Ohio State Offensive Coordinator and Offensive Line coach Jim Bollman to be offensive line coach/running game coordinator. Bollman comes with a wealth of college and professional experience. Almost as importantly he overlapped with Spaz one year at UVA and was Tranq's OLine coach at Michigan State (so there is more familiarity with Spaz than say Kevin Rogers had). He's available because Urban Meyer decided to bring in most of his own folks at Ohio State. They gave him the running game coordinator title, but I wouldn't read too much into that. Martin is still going to call plays. I assume that Martin and Bollman have a some familiarity given the Ohio connection between the two. Ohio State fans are mocking us, but I am not too concerned. If Bollman can just get our guys to be more consistent and less confused on plays, he will have done his job. I'll have more on Bollman as I learn more. For now I am optimistic. We needed a teacher and a veteran who has seen it all and can instill fundamentals back into our offensive line. On paper Bollman is that guy. Sean Devine will remain on staff as the Tight Ends coach...and that is a good thing. He's been one of our hardest working recruiters. I know OLine U fell apart under his watch, but I think it was probably a bad fit from the start (I'll explain why in another post). Now he can redeem himself by helping us close out strong on the recruiting front. Luke Kuechly is leaving BC early to enter the 2012 NFL Draft. It is not really surprising and stinks for BC fans, but it is the right move for his football future. Experts project the All America Linebacker to be a first round draft pick, likely to go in the teens. 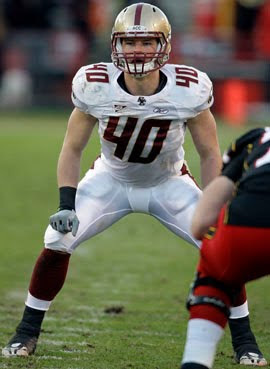 The prolific Kuechly broke tons of records and earned dozens of awards while at BC, so there wasn't a lot left to accomplish. I take him at his words when he says he loves BC but his draft stock will never be higher. While BC should improve next year, I don't think Luke is going to miss a championship run. I don't know what his legacy will be. He wasn't flashy. He dominated during a blah time on the Heights. Even though it is unrelated, I think a lot of what we think of his time will be influenced by his success as a pro. But there is no denying that he made a huge impact while on the field. His productivity is unmatched and I've never seen a guy shed blockers like he did. No one on the teleconference asked him about his injured elbow but I imagine Luke's stock will go up through the combine and interviews. He's got underrated speed and incredible instincts. People will wonder about his size as a MLB in the NFL, but I think he'll be great in any system and any position. As with all BC guys, I wish Luke nothing but the best and thank him for representing BC with such class. BC begins ACC play this weekend against North Carolina. As you can imagine, the Tar Heels are heavy favorites. I just hope that BC keeps it close. UNC will be without one of their freshmen stars in James Michael McAdoo. Here is Andy Katz's overview of the ACC. I found this roundup of links regarding Dana Holgorsen to be very enlightening. As we continue to struggle scoring points, I think our approach to offense has to change. It is not just play calling. It is about execution and preparation. BC offered a scholarship to 2013 target John Montelus. He is an offensive tackle from Everett. In an offbeat but interesting story, Billy Flutie saved someone from chocking at the Applebee's in Cleveland Circle! BJ Raji is ready for another Super Bowl run. The women's basketball team lost a heartbreaker to Virginia Tech. The women's hockey team also lost a close game, falling to St. Lawrence 2-1. Luke Kuechly has yet to make a decision on his NFL Draft status. This post from Draft Insider claims that he is torn between his love for BC, unfinished business in college and the fact that his draft status is at its best now. What isn't mentioned anywhere is the status of his elbow. The rumors floating around say that injury is more severe than most know. The smart move is for Luke to bolt, but selfishly I would love to see him back. Mark Herzlich is still not 100%. BC's outdoor hockey game at Fenway has been moved up two hours to 4 PM so that fans can watch the Patriots' playoff game that night. Thanks to John W for passing along this Atlantic article on college sports. The Flutie Effect gets mentioned but it is not the focus of the article. I know the stats of the Flutie effect have been debated and challenged for years, but I do think sports (specifically football) have had a definite positive impact on Boston College. While the school is so much more than sports, sports has been a great vehichle for spreading that message. And our unique position of being the only Jesuit school playing big time sports is a strong selling point. In contrast, this is the type of article that makes you cringe at college sports. Nothing makes the process seem more exploitative and mercenary than learning kids are picking programs based on jersey numbers. Let me say that this was a bad, bad loss. URI is not a good team and BC squandered multiple chances to win. But I will keep looking on the bright side. Despite the mistakes and head scratching decisions, there were some positives that have me optimistic about being competitive in most ACC games. As always, leave your thoughts below. -- Heckmann made a clutch shot to force the second OT. The drive and pump fake and the patience were huge. It was the type of move that would have been good against most teams. -- Ryan Anderson's overall play. He was the best player the whole game. However, he was pulled for parts of the overtime when we needed more outside shooters. It was a questionable call. -- Our flaws can be corrected. In my opinion, the two big areas of concern -- rebounding and movement on offense -- can be improved. While rebounding is somewhat instinctive, there are adjustments Donahue can make to improve things. -- the rebounding. Guys were overpowered. Guys gave up. Guys didn't follow shots. It was bad all around and the big reason we lost. -- No idea on many halfcourt sets. There were tons of possessions that were pass, pass, pass, force something. I am not saying bring back the flex, but the players need to have purpose and urgency. Too often guys are just standing around. -- The rotation is getting tighter yet results are not showing. Daniels, Heckmann, Clifford, Anderson and Jackson got the majority of the minutes. All were good to decent. Yet they still don't play with any comfort with one another. We had a critical turnover towards the end of regulation where Daniels passed it to Jackson over the midcourt line. It created a backcourt violation. But both the whole team was at fault. No one moved for Daniels. No one alerted him to the pending trap. Jackson was already moving back on D when the pass came his way. I know these guys are all freshmen, but we need baby steps. In the middle of this link is an update on BC verbal commitment Akeel Lynch. He continues to take visits and doesn't sound like he is headed to BC. BC basketball lost out on prime target Luke Fischer. The Wisconsin big man has decided to attend Indiana. Former BC QB Justin Tuggle will play linebacker for Kansas State next season. He is third on the depth chart so LB might be the only way he sees the field.